During the recent years two remarkable trends have occurred in the economic sector: a striking growth of small entrepreneurs worldwide and an upcoming number of women participating as employees in the labor market. Indeed, an increasing number of women have started their own business. Thus, women’s share of business ownership is growing and research is done how these business are funded. 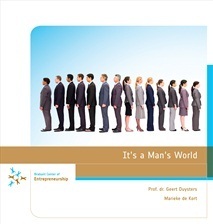 Marieke de Kort, founder of the Dutch on-line community for businesswomen O+ zakenvrouw van nu, has investigated the issue of gender, entrepreneurship and venture capital and has agreed to share some of her findings with The NextWomen. Part I is about the importance of venture capital for businesses and Part II why women are getting less of it. Venture capital is finance provided to companies, mostly in exchange for an equity stake of the company or product. These financial resources are vital for an enterprise, since it enables the company to move into the second stage. It may be used for instance as an investment for product innovation or research and development. Venture capital is provided to companies by either specialist financial institutions or by informal venture capitalists. Financial institutions such as banks offer loans to entrepreneurs. These financial institutions demand the payment of interest on the invested capital. Informal venture capitalists (or informals) on the other hand are mostly wealthy individual investors who are willing to invest in start-ups, early stage businesses or expanding enterprises, in exchange for stocks and bonds of the company. Why are informal venture capitalists important for a business? An informal venture capitalist can have two functions for a company: Firstly the informal provides the actual capital injection and secondly, he can offer either his advice or his network. Although this may seem trivial at first sight, such expertise and network connections may be even more important than the actual loan. For some entrepreneurs, it is one of the main reasons to solicit for an investment from an informal investor. Are there differences between financial institutions and informal investors? There are several differences between financial institutions and informal investors. One of the major differences with financial institutions is that private individuals are not listed on a stock exchange. Second, banks are often reluctant to lend money to small businesses because of low expected profit margins, asymmetrical information and high risks. Venture capitalists, however, are more willing to invest in these organizations, and are prepared to be less risk averse than financial institutions. The companies invested in are organizations which often have a limited operating history, are frequently too small to raise capital on the public markets and are too immature to secure a bank loan. In exchange for the high risk venture capitalists often take by investing in smaller and less mature companies, venture capitalists usually get significant control over the decision making process of the company, in addition to a significant portion of the company’s ownership. Carter, S. & Jones-Evans, D. (2006). Enterprise and Small Business. Principles, Practice and Policy. (Second Edition). Harlow: FT Prentice Hall. EIM, 1998, Kleinschalig Ondernemen 1998: Structuur en Ontwikkeling van het Nederlandse MKB, Zoetermeer.